Since it’s health literacy month, this post continues the theme of ways that educators and trainers can contribute to improving health literacy. The greatest opportunities for reducing health disparities are in empowering individuals and changing the health system to meet their needs. We cannot expect people to adopt the health behaviors and take the actions we champion without clear communication, supportive activities to build skills, and organizational changes to reduce the demands of our recommendations. Sharing—We must share, among ourselves and across disciplinary and organizational boundaries, information, findings, program successes, and areas for improvement. Technology—Being mindful of the digital divide, we must consider technology as an essential tool for improving health literacy. Evaluation—More programs need all types of evaluation, especially evaluation that accounts for what is important to different population groups. Partnership—We must create partnerships with communities and each other. 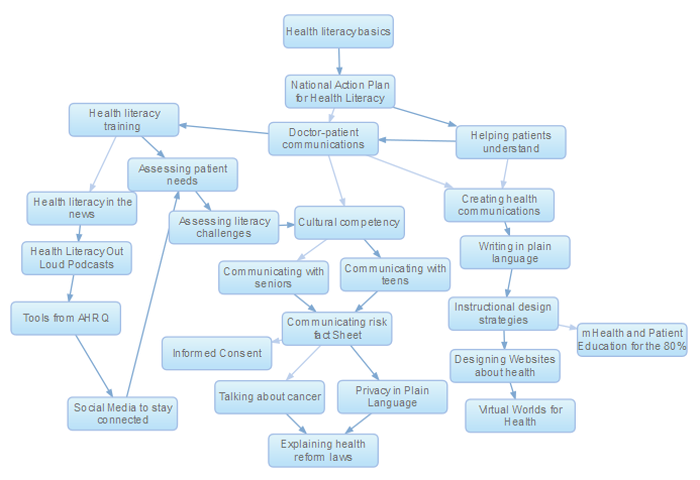 Participation—Health literacy has its roots in community engagement. We must partner with the people whom we are trying to help. To participate in STEPP, I’ve created a list of 25 health literacy resources using Trailmeme. To access these resources, use this link. An overview of what you’ll find is illustrated below. A Trailmeme of resources for evaluating the credibility of health information is here. In subsequent posts, I’ll write more about how the Action Plan can be used to guide the development of health education materials.